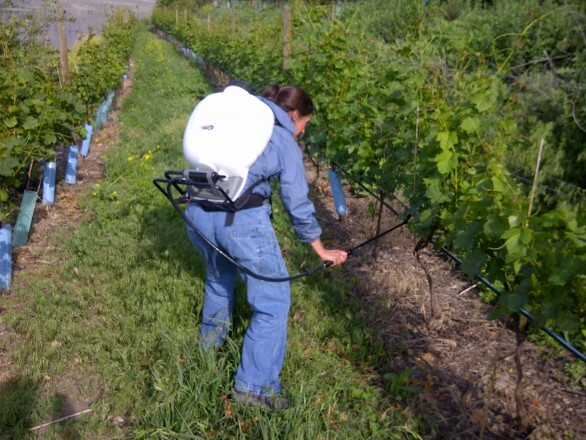 Spring is the time when nature wakes up and insects start to appear in the vineyard. 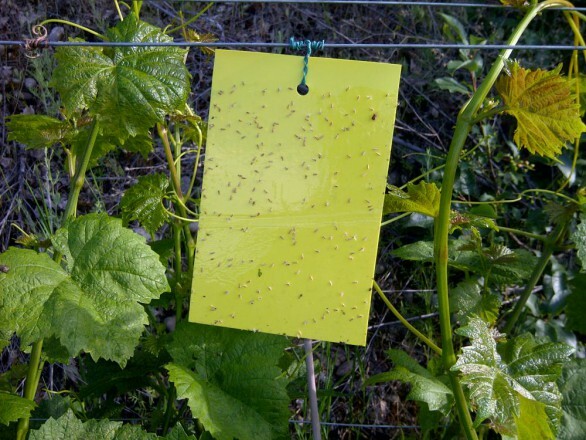 Yellow sticky traps allow us to follow the kind and number of insect populations living in the vineyard. Leafhoppers are insects that feed by piercing and sucking sap on the grapevine leaves. They induce damages that are visible as little yellow dots on the green leaf and reduce the plant capacity to perform photosynthesis. A few leafhoppers is not harmful for the vine, however too many can be detrimental for the quality of the wine. Then by monitoring the population of leafhopper nymphs under the leaves we know if it is worth it to treat and how. When it is needed and if possible, a simple soap treatment allows us to control locally the population of leafhoppers and offers a real sustainable alternative to other chemical spray.